The rhetoric surrounding cannabis has long been blurred by politics, location and of course a heavy dose of hearsay and rumor. What are commonly referred to as different entities: “hemp,” “marijuana” and “cannabis” are all genetics of the same genus and species, Cannabis sativa L. Industrial hemp jobs involve working with the same plant as cannabis cultivators who sell their crop to medical and rec dispensaries. Only with hemp, the product is sold primarily for its structural properties and nutritional benefits. A notable difference between hemp plants and “marijuana”/”cannabis” is the lack of psychoactive cannabinoids. Hemp is legal to grow and sell for industrial uses – in order for it to be considered hemp, however, it must contain very little to zero percent THC. Hemp plants have been selectively bred to sustain regular levels of CBD, but nothing that encourages psychoactive effects. What are Industrial Hemp Jobs? Much like other cultivation positions, industrial hemp jobs involve more than just farming. The raw materials are cultivated, sure, but then they are sent off for additional processing to be used in everything from paper to fuel. Cannabis is truly one of the most versatile plants out there with strong marks across the board in medical benefits, psychoactivity, nutritional value and much more. Whereas hemp is primarily grown to be used as raw material for a variety of industries, cannabis has the weed consumer in mind. There are some differences in growing high THC buds vs. non-psychoactive plants. Since the end result of hemp is not about the high, the focus can be placed instead on growing study plants. While psychoactive cannabis is grown to be fairly small (usually under six feet) hemp is grown more vigorously to produce as much pulp and other raw material as possible. Hemp seeds are unique as they contain an amazing spectrum of health benefits. For starters, the seeds are very high in protein, containing all 20 amino acids. Additionally, hemp seeds are a great source of “good fats.” Hemp seeds contain a range of vitamins and minerals including Vitamin A and Calcium in high concentrations. Hemp is commonly infused into topical products to aid dry and damaged skin cells. Hemp seeds are said to have regenerative properties thanks to the presence of GLA (gamma-Linolenic acid). It also helps ease pain and inflammation when taken as a non-psychoactive oil. The hemp sector of the cannabusiness is involved in the production of hemp seed oils and concentrated CBD oils. 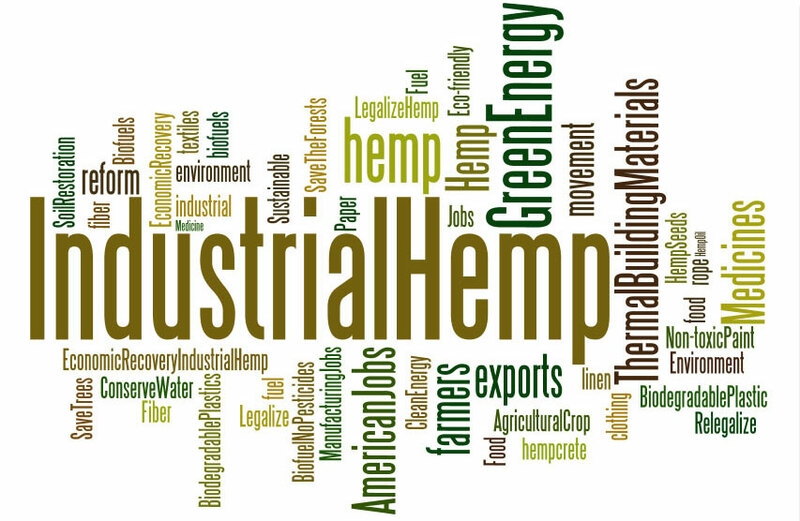 Industrial hemp jobs in manufacturing these products are gathering steam the world over. Industrial hemp jobs working as cannabis extraction technicians are important to ensure no psychoactive material carries over into products. Especially when formulating CBD oils and other health products, extraction techs use CO2 and other extractions to retain as much cannabidiol as possible, separating away THC and any unnecessary additives. Cannabis extraction technician jobs can pay respectable salaries, depending on the employee’s level of responsibility. Regardless, it is an important position in legally providing CBD-rich products to customers around the country. One of the more frustrating results of the oppressive scheduling of “marijuana” by the American DEA is that it makes legitimate, scientific cannabis research difficult to conduct. In addition to having to work against stigma and apathy from most doctors (even those who prescribe pharmaceuticals with THC and CBD isolates) it is hard to get any grant funding, since cannabis is still federally illegal. Nevertheless, there are brave cannabis researchers continually providing evidence for the manifold benefits hemp and cannabis genetics have in the world of medicine. While you might think of edibles purely for its function in getting you high, turns out it is also extremely useful as a way to consume CBD. Edibles aren’t made using old-fashioned methods of cannabutter, rather the tasty treats are infused with CO2 extracts of cannabis flowers. The only difference between these edibles and the others is THC content. CBD edibles simply separate out the psychoactive matter, but keep the remainder of the cannabinoids and terpenes intact. Industrial hemp jobs cooking CBD edibles are appearing in more commercial kitchens across western United States. Trained chefs and cooks are marching in droves to strut their stuff in the field of cannabis. Chefs are tasked with preparing exquisite products and infusing them with accurate concentrations of CBD. Of course, the end product also has to taste good. Because of the responsibility involved, edibles chef salaries are usually competitive and in some cases can reach six figures. While there are plenty of industrial hemp jobs proliferating as more uses for the plant are revealed, the majority of new jobs in the cannabusiness are in the medical and recreational cannabis sector. Medical marijuana jobs aren’t exclusively about making products to get customers stoned, they also seek to help patients without access to helpful medical treatments. A large percentage of careers in the legal cannabis industry appear in marijuana dispensaries. Dispensaries are pot shops that sell cannabis flower and other products to customers. Believe it or not, cannabis dispensaries on the whole are pretty unassuming, appear in strip malls, busy metropolitan areas and small neighborhoods. The dispensary atmosphere is calm, yet professional for the most part, although each business is different. Working in a legal dispensary if you did not grow up with legal weed is somewhat of a strange concept. On the one hand, dispensary workers are given the go ahead to sell products to customers, but they are constantly supervised should they fail to follow compliance measures perfectly. Typical marijuana dispensary jobs include budtending, front desk/reception, management and security. Each job is important and can act as a critical springboard for further success in the cannabis business. Budtenders in particular have risen to fame as the faces of the industry, since they are the individuals responsible for directly selling cannabis to customers. Budtenders are expected to retain a vast knowledge of cannabis strains and extracts. A good budtender will have personally tried as many products as possible to help accurately provide helpful insight. Additionally, these employees must be fully briefed on and confident in all the regulations in their city and state. Hemp appears throughout innumerable products that offer therapeutic remedies for the hair, skin the and nails. Hemp seed oil contains many amino acids that are beneficial for damaged skill. It has been proven to be helpful in reducing symptoms of acne and eczema as well. As well, hemp is often used as a milk, fat and protein replacement or supplement to be used in cooking, coffee and more. One of the most compelling uses of hemp is for fuel; once again the plant is often disqualified from being recognized as a valuable source because of its tumultuous history. Throughout American history, hemp has been a major raw material used to make textiles. Hemp is fibrous and holds up well as clothing. What’s more, it’s not uncomfortable or awkward to wear! Hemp is not an especially difficult crop to grow and it has the potential to help so many people across the world. The only thing stopping the greater proliferation of hemp business are powerful corporations and government entities who riddle the Cannabis cultivation process with hurdles. The legal positioning of hemp is not based on any hard facts separating one strain from another. It was only within the last fifty years that hemp became classified as containing less than 0.03% THC. This number has made it difficult for cultivators with slightly higher levels of THC in their hemp to have to undergo further measures to filter that compound out while retaining the other beneficial cannabinoids. However, this is expensive, causing farmers, manufacturers and consumers alike to pay more because of an arbitrary concentration requirement. Ironically, the same cannabinoids that are scheduled as illicit drugs are frequently harvested to be used in pharmaceuticals. CBD and THC can appear pure thanks to crystal isolates and other methods. With all that said, these prescription pills are vastly less effective than when the same cannabinoids appear together in Cannabis sativa L. Furthermore, the reason cannabis can be so medically beneficial is because it is assisted by other compounds. The trend for industrial hemp jobs will likely follow its current path of growth as the legal cannabusiness expands further. While the politics surrounding cannabis legalization and regulation remains unclear, it is evident that a large consumer base desire products both from high THC “cannabis” and THC-free “hemp”. As we realize more and more of the benefits this miracle plant has to offer, the benefits it could bring to a more accepting society are innumerable.